Worried that the expenses of your print resources are increasing day by day? Want to track the wastage and know about the productive use of it? If it is so with you then you need to try O&K Print Watch 4.3. It helps you to keep an eye over the print jobs and get all the related details. 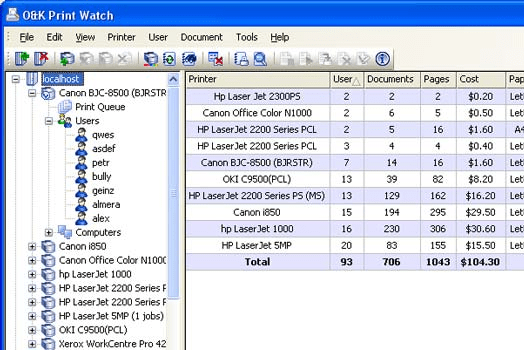 It works for as a print manager and print monitor that gets all the record of print jobs and the usage of pages. While racking all the records for you, the program provides you with information like the computer name, user name, date, time, paper size, number of pages, etc. It allows you to set the restriction for each user by setting the printing quota by pages and cost. You can have the records for all the print jobs generated in the form of reports. It supports working with print-server in network and various database servers. O&K Print Watch 4.3 when launched detects the printer connected to the PC and on network; choose the printer and add them to the list. It also detects the computer on the network that can be listed with usernames. Set the cost of pages and printing that helps you to get the calculation for the total print jobs conducted with the expenses incurred on that. The software checks for all the jobs that are being carried out by various computers. You can have the job canceled if you want and allow the ones you think are appropriate. Get the details of the print jobs for each computer and user. Manage the details and have the reports generated in HTML format. You can search for any specific printer, user or computer. O&K Print Watch 4.3 gives you full command over the print jobs and manages the expenses well. Rating point of 4 has been given to the software for functioning and ability to detects the print jobs and let you have control over the printer related functioning.